April 28th in Plugin Lists, Wordpress Plugins by Wordpress Jedi . Responsive Logo Showcase: comes with grid, carousel, and perspective versions with multiple skins. It offers touchscreen navigation for mobile devices. Smart Logo Showcase: comes with 30 templates and supports horizontal and vertical sliders. You can add a link to each each image. It is possible to add social links, websites, and other extra fields in full view or popup templates. Client Logo Carousel: displays client logos in a responsive carousel. It comes with simple shortcodes to showcase your customers anywhere on your site. Lets webmasters control the number of logos to be displayed. Logo Carousel: lets you promote partners, clients, and sponsors on your website. It is responsive and can be used to create multiple carousels. Logos Showcase: this plugin gives you 3 ways to show images on your site (normal grid, responsive grid, and horizontal carousel). You can group your images by category and display only a selected category. The script lets you customize its settings easily. Logo Slider: a lightweight plugin to add a responsive logo slideshow carousel to your site. You can reorder it via drag & drop. The pro version offers even more features. Easy Logo Slider: this plugin lets you upload logos of clients and partners. 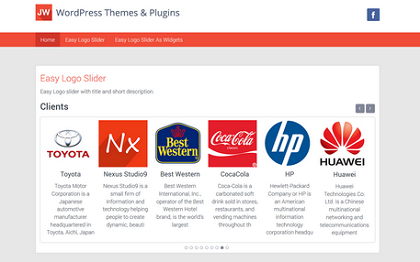 It is fully responsive and lets you add links to each logo. The slider pauses on hover. My Logos Showcase: it has 10 themes, 25 image effects, and 4 display options. You get 10 slider features to customize how images show up on your site. You could always write your own code and CSS to show logos on your site. The above plugins simply save you some time.